I'm really learning to enjoy the freedom that the new digital technology has brought. 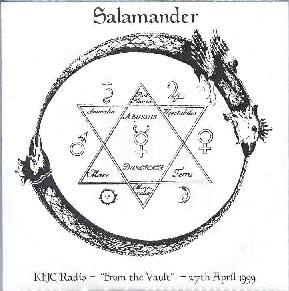 With seemingly little effort, the members of Minneapolis' Salamander prepared an hour-long radio show for a local indie station and then turned it over to Tony Dale, who had 100 copies burned to disc for release on his new sub-label, intended for just these purposes. It makes a nice little package of rare goodies and works-in-progress that we can look forward to hearing again in final form later on. Included on 'From the Vault' are a couple interviews with main protagonists Erik Wivinus and Sean Connaughty, against a backdrop of spacey ambient music. Sean's part includes some statements on the general philosophy of the band and the development of their improv style. Also included are a sampling of tracks from the spinoff bands Gentle Tasaday and Vortex Navigation Company, which I won't get into as there are full reviews of these in the regular Review section. By far the coolest aspect are the two "Untitled New Songs" that bracket the disc. "UNS#1" is a mantric work with poetry lyrics and tabla percussion along the lines of Saddar Bazaar, only better. "UNS#2" is a more folksy tune, again in a minor key, and features a neat effect that I'll call a 'space whistle.' "You Think Shrinks are Nuts" and "You No. 9" are more dreamy and lysergic works that sound like cleaner early Hawkwind material (Text of Festival days). Space out, man. Well, for a band that was defunct for a few years before this recent resurrection, I'm happy to say that we have some more great things to look forward to from the Twin Cities. This little community of space bands (also including Skye Klad) have really hit on something special, and I'm ready to drink it all in. Their fully-evolved works "Red Mantra" and "Red Ampersand" (both Camera Obscura) are what to initially look for of course (as these are both 'must have' items) - more easily found in the Northern Hemisphere anyway. But to the primed Salamander fan: You should definitely get your hands on one of these collectable items before they quickly vanish.